"Awesome Aroostook" is a fascinating one-hour show that takes the viewer around The County over the course of a year to discover some of the exciting people, places and things that make Aroostook and amazing place. There are nine chapters and the viewer may select which ones to watch. Each chapter could have been a half hour show in its own right because the stories are so interesting. There are farmers,artists, inventors, historians, scientists and entrepreneurs living and working in a place that inspires them to do incredible things. 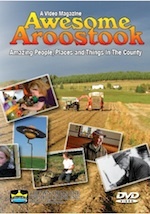 "Only in Aroostook would you find people like these succeeding in such a hardscrabble environment. This film shows how family and friends coming together is a common way of doing things in Aroostook County." •The Phantom in New Sweden - a space age snowmobile made from found parts. •Friends Quaker Church near Fort Fairfield, a last stop on the Underground Railroad. •MSSM in Limestone, where students engage in exciting projects from firing off rockets to making lava lamps! •Solar System Display from Houlton to Presque Isle – a true-to-scale installation. •A new café in Presque Isle, where local organic potatoes are turned into works of art. •A scientist, whose collections in Caribou include nearly forgotten images of Swedish settlers. •An Acadian family in Fort Kent, who credit their buckwheat ploye mixes with saving the family potato farm. •Bridgewater General Store, where Mennonites provide a trip to yesteryear.